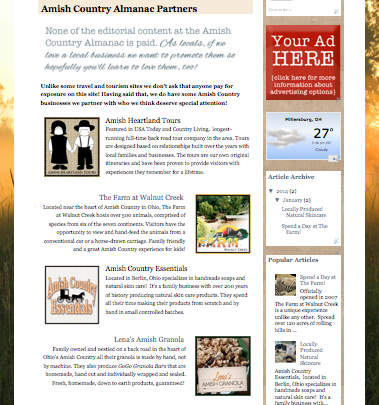 Thanks for your interest in our Advertising and Partner opportunities here at the Amish Country Almanac. While we never ask anyone to pay for editorial content on our site we do sell specific ad space and do have partner relationships with many local businesses in Ohio's Amish Country. 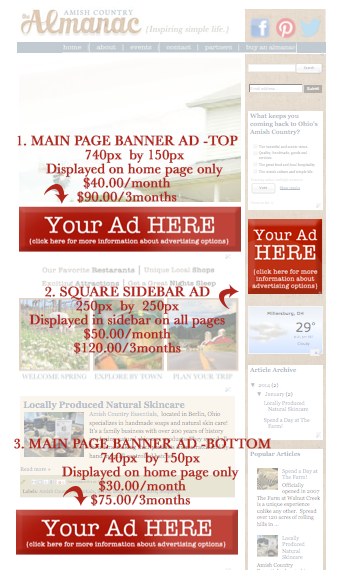 At this time we have two sizes of ad space available, banner ads and sidebar ads. The Main Page Top offers great exposure, placed just below the main image slideshow it is sure to be seen by each and every visitor to the site. This ad is only displayed on the main homepage. $40.00/month or only $90.00/3months. This price also includes at least two monthly FB posts on behalf of your business. The Main Page Bottom is displayed lower on the homepage, but the benefit of this ad is that, unlike the first option, it is displayed on every page of the site. $30/month or only $75.00/3 months. This price also includes at least two monthly FB posts on behalf of your business. This is our most economical advertising option. Square Sidebar Ad: sized at 250px by 250px this ad option will get you the most visibility and exposure across the entire site. This generously sized ad is displayed not only in the sidebar of the homepage but on every page of the site. $50.00/month or only $120.00/3months. This price also includes at least two monthly FB posts on behalf of your business. 1. $35.00 listing fee/per month - this covers the cost of the labor involved in adding/maintaining your listing and description on our Partners page. You can sign up for as little as one month as an Amish Country Almanac Partner or extend that partnership, with the same terms for up to one year before re-negotiating. The images below will show you the ad display positions on the site as well as a sample page of what your partner feature will look like. Example Partner Page and listings. More information about how we run promotions ans giveaways! People love free stuff...giveaways are not only a great way to build a loyal and interactive following but also you have the opportunity to get your products in the hands of people who may not have experienced it before. Here are a few main points about how we like to run giveaways. 1. We use a giveaway widget so that we can track and catalog who enters. This means that after the giveaway is over you will be able to get your hands on the contact information of the people who entered and can add those people to your own marketing database. 2. Because we use a giveaway widget you can embed the code for the widget on your own website or facebook page if you so desire. This means that the giveaway is running, in real time, in multiple places at once, for even more exposure. 3. We tie our giveaway entries to an action. Example, "To enter, like us on facebook" or "To enter, Follow us on twitter", or even "To enter, share this promotion with a friend" - you get the idea. What this means for you is that you will have the opportunity to gain more fans, friends, and followers for your business while the promotion is running. Have more questions about anything you've read on this page? Use the contact for below to send us a message. What keeps you coming back to Ohio's Amish Country?